When you are looking online for images to use in your website, marketing and social media, it’s important to understand and follow the below guidelines to ensure your use of photos avoids copyright infringement. Always assume an image online IS copyrighted. Using copyrighted images without permission could incur a $25,000 fine. Embedded information and other tools lead copyright owners to websites using their images. Copyright law does not require the owner of an image to include a copyright notice. 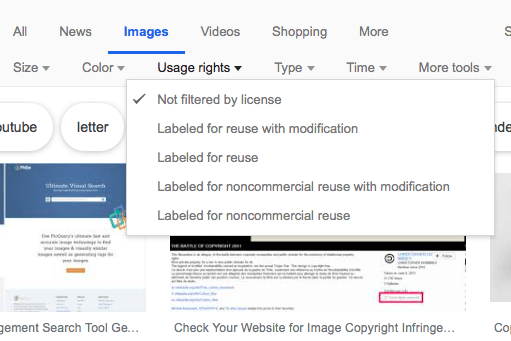 When you search Google, use the TOOLS link to find images that are not copyrighted.